Poverty & Wealth II (Part II of II): What Do We Do Now? Question: What were you doing at 11:27 at night on May 30th, 2002? It was a Thursday night—I looked it up. Many of you were in bed, getting rest for school the next day. Maybe you were sneaking in a few last moments of a book, homework, or a video game. Maybe you were complaining that your parents didn’t let you stay up later. Maybe you were glad to be sleeping because you had a rough day. Regardless, most of you were as young as four and as old as eight years old. We are going to see what one little girl—approximately five years old—was also doing on May 30th, 2002, at 11:27pm. It will be a little difficult to see this, so you’ll have to look closely, pay attention, and really concentrate (I cannot make the picture any larger). Try and figure out what is happening. Question: What happened there? What was the little girl doing? Did you notice how many people walked by her? Eight. Eight people walked right by a homeless child who was carefully making her “bed” and tucking herself in for a night of “sleep.” They walked right by and did nothing. Nothing. One guy was even counting his money as he walked by!!! And notice that this girl was not screaming for help or crying because of her situation. She was calm and collected. Do you know why? Because she has probably done this many times before—she has probably been homeless for a long time and is used to it by now. I wept when I first saw this last August…I cry less now that I have seen it a few times. Now, instead of being sad and hurt, I’m angry. And if I’m angry, sad, and hurt over a little girl I have never met and am not biologically related to, how much more does God feel the same—only intensify it by a billion times—because He made the child by hand, personally, in His image, and died for her on a cross. This is what it means to be a Christian—a Christ-one—to know Jesus, to be like Jesus, and in the name of Jesus to do something, anything, no matter how little it may seem to us, to take care of other human beings who are suffering. This is what it means to be a “Christian,” my friends; this, and more, but nothing less. And hopefully, by the end of this day, each of us will walk away knowing what we can do now, today, to start ending poverty. Illustration: Two Children and the Starfish (written & drawn out by SoulSpartan based on a short anecdote he heard somewhere). One morning dark and ominous storm clouds were rolling in across the ocean, and their parents made them stay inside—the weather was supposed to be ferocious. Sure enough, the storm hit, and the young boy and girl munched on chicken nuggets and macaroni & cheese, glued to the patio windows as they watched nature’s fury wreaking havoc on their normally pristine beach. As the friends normally did, they met up the next morning after breakfast for their regular adventures on the beach. But as they met up, they were stunned at what they saw. The entire beach, as far as the eye could see, was covered with starfish swept out of the ocean by the fierce storm. The two friends were horrified—they knew that the starfish would not survive long outside of the water because, since they don’t have blood, starfish actually use filtered sea water to transport nutrients throughout their bodies. The two friends ran home crying, screaming for their parents to help them. Their parents were a bit surprised, and asked them what was going on. The friends explained frantically, and asked the parents to help them throw the starfish back into the ocean. The children ran ahead and were furiously throwing the dying starfish back into the sea. 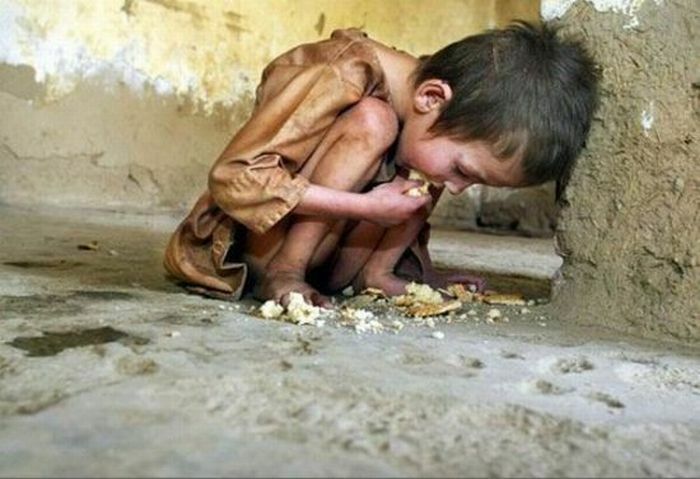 -Suffering from material poverty can lead to death: hunger, homelessness, lack of water, etc. -Suffering from spiritual poverty always leads to eternal death: separation from God forever. While on earth there are some who suffer from poverty and some who don’t, the Bible teaches us that EVERYONE suffers from spiritual poverty—we are born separated from God, and without getting plugged back in, like a computer without electricity, we die spiritually without God. Jesus of course realized this, and that is why on earth He helped people in both ways. “When the apostles returned, they reported to Jesus what they had done. Then he took them with him and they withdrew by themselves to a town called Bethsaida, but the crowds learned about it and followed him. Question: What does the text say that Jesus did? Response: He welcomed them, told them about the kingdom of God, and healed their bodies. A. They were physically sick and needed healing—so He healed them. B. They were spiritually sick and needed healing—so He told them about the cure: Himself! B. knowing Jesus, who alone can save the world from their sins for anyone who believes, asks, trusts, and follows Him. …In fact, it’s not silly, it’s cruel (and the opposite is true as well). 2. Helping others is simple (not complicated), but it is not easy—A Case Study in Helping Others from Scripture. The disciples did so, and everybody sat down. Taking the five loaves and the two fish and looking up to heaven, he gave thanks and broke them. Then he gave them to the disciples to set before the people. Question: So what do we learn from this account—how does this apply to wealth and poverty? A. The Disciples Notice the Need and Ask Jesus to Help the People (verse 12). B. Jesus Commands the Disciples to Help the People Themselves! (verse 13). C. The Disciples Respond—“We Can’t Do It, Jesus!” (verse 13). 2. Helping others is simple (not complicated), but it is not easy. But that way of doing things all ends…today! Question: So how do we do this? This is difficult. How do we end poverty and learn to share? Question: What is Jesus saying here? What does this verse mean? A cop-out is when you don’t do something you are supposed to do and you come up with a slick excuse that makes you feel better about not doing what you’re supposed to do. A. “The dog ate my homework” (Hah—yeah right!!!). B. “I didn’t steal anything, my friends did. I was just with them” (Bo-gus!). C. “He hit me first!” (Try again, pal). D. “It’s not my mess—I didn’t make it!” (Wrong again, dude!). The bottom line is this: Jesus is saying that if we cannot obey Him in the little things, we won’t obey Him in the bigger things. A. If we aren’t generous with the five bucks in our pockets, we won’t be generous with five million. B. If we aren’t kind and don’t share with the people in our house or in our neighborhood or in our youth group, then we won’t be kind and share with people we’ve never met who live thousands of miles away. That’s Jesus’ opinion…do you think we can trust Him? Transition: So how can you start to help ending poverty in the world? 1. Ask Jesus to help you to help. Just like the disciples, we can’t do this alone. A. Jesus wasn’t kidding when He said, “Apart from Me—[without Me]—you can do nothing” (John 15:5 NIV). So ask Him to help you, everyday, when you wake up, before you go to sleep, and throughout your day. Just ask Him for help—it takes like fifteen seconds total. If we can’t—or won’t—give 15 seconds per day to ask for Jesus’ help, then we are kidding ourselves if we think we’ll give a day or a week or a lifetime to serve Jesus and others around the world. 2. Start small—at home, school, work and church. A. Share your stuff with your siblings (and not because you have to!). B. Help them with their homework. C. Help them do their chores. D. Help them clean up their messes. F. Invite them to hang out with your friends. G. Write them a note telling them how much you love them. I. Honor your parents and others—for real. J. Right away when you get home from school, ask your parents if there is any way you can help them. K. Do your chores without huffing and puffing. M. Say thank you after dinner, and when your Mom and/or Dad get home from work, run up to them and thank them for working hard today. They had to be respectful and obedient at work, so they know how you feel. If you don’t respect your parents, my friends, then you don’t respect God. Simple as that. Jesus said whatever you do to the least of these brothers and sisters of mine, you do to Me. Again, Jesus wasn’t kidding here. N. Respond to them and come downstairs, come to the dinner table, get off the phone/internet/video games. etc., the first time they ask you to. Anything less is disrespectful and rude, and your parents deserve better than that. O. Put some thought and effort into the gifts you get your parents for their birthdays, Christmas, for Mother’s Day and Father’s Day (you do get them gifts, right?). Seriously, put some thought and effort into it—you don’t have to spend a lot of money, but you do have to invest a lot of thought and effort. Trust me, they do the same when they think about what to get you on your special days. P. Look around and notice the people who need a friend. Q. There are still many of you who have been attending this church for years, who have been meeting at church with the students in your grade for years, and you still don’t know very many people. That’s crazy! The number one reason that other 5th-8th graders don’t come to church here is not because it’s boring and it’s not because the leaders are mean: it’s because they say that they don’t have any friends here—they don’t “know anyone!” All you have to do is enlarge your circle of friends—look around and invite other people in. Your friendship, just like your money or your stuff, is not yours to keep to yourself; God has blessed you with a wealth of personality so that you can be friends with others, not so you can stay with the people you already know. 3. Do your best in school—try (really try), don’t underachieve! A. You go to school, take tests, and do homework for one reason: to develop and strengthen your critical thinking skills (your ability to think and figure out stuff). That’s the reason. And if you do your best in school (I’m not talking about just getting A’s, I’m talking about trying your hardest to learn and understand the material and get the work done with excellence and on time), then you will have the thinking skills when you’re older to solve some of these problems of poverty! 4. Don’t be afraid to be successful—it’s not wrong! A. You also need to do well in school to get good jobs—we need more Christians who are CEOs, Executives, world-class musicians, actors, lawyers, doctors, principals, college professors, engineers, architects, writers, movie producers, etc. Figure out what you are good at and what you love and do it as well as you can do it for Jesus. If it means you make a lot of money, then great! That’s a blessing (and a responsibility!) from God! If it means that you become famous, then great. Then you can use that money, you can use your influence, you can use your experience and intelligence, to help those who are suffering in poverty. If God has blessed you with a wealth of talent at something, then go do it, and do it well! We can’t help people in poverty—children like the girl in the yellow dress—without having people who are good at advertising, speaking, writing, planning, handling finances and investing, organizing people and supplies, law, medicine, sociology, science, etc. It’s a total team effort! Creeds n Deeds (monthly) and the Summer Mission Trip to Chicago (annually). A. We average about 15 people at each of our monthly service projects that usually only take 3 hours of your time—I’m proud of you for that, but we have 275 students who could go. That means less than 10% of you actually come out and serve each month! B. We average about 28 people each year for the Summer Mission Trip in Chicago—and I’m proud of you for that too! But we have approximately 200 people who could go. That means that only about 15% of you go on that fantastic trip! Wait—do you hear that? Listen…My “cop-out” alarm is going off! -Your Team, the Body of Christ, also needs you to do what Jesus died for us to do. -You can invite your friends to come with—that makes serving even more fun! -Studying the Bible endlessly without acting on it is annoying to God—in part, we read the Bible in order to do good things, not just in order to know good things. -You can reschedule your vacation—you have thirteen weeks of it! Bottom Line: With all of the facts you have learned these last two weeks and with all of the practical things you 5th-8th graders can do right now to help those suffering in poverty, you don’t need to ask yourself whether or not you are going to do something now. “Do I really love Jesus? Do I really believe what I claim to believe? is a gift from God, not a curse! so that others can thank Jesus, know Jesus, and love Jesus too.